Courtney here. I have an important question to ask. 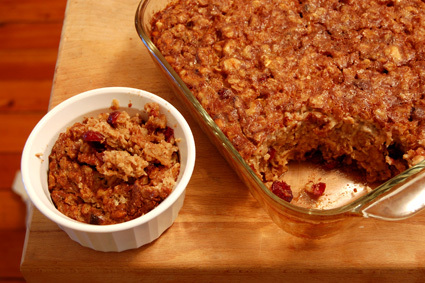 Have you ever had baked oatmeal? See picture below. Have you had it? Do you understand what I’m saying when I say “baked oatmeal”? Sometimes, when I ask this question to family, friends, and random people I meet in the grocery store, I receive the look of, “you’re talking crazy, Court.” This then leads me to immediately sigh in exasperation, spew off ingredients and directions, and demand that these people return home and immediately make baked oatmeal. I’ve been known to make these poor people pinky swear me on it. I don’t mess around with baked oatmeal. The first time I had it was when I was at UW-Eau Claire’s Campus Crusade fall retreat when I was a senior in college. The camp’s kitchen crew made it for us — and honestly, it made sleeping in a cold cabin with 20 other women and getting up at 8 a.m. on a Saturday morning totally worth it. Make some baked oatmeal. This is my own recipe that I’ve tested and combined with various others. Feel free to make it your own way. It’s hard to mess this one up. Enjoy friends. *Peaches, pears and apples are good choices. If using apples, make sure to slice them thinly or they will be crunchy. 1. Preheat oven to 350° F. Melt butter; pour 4 Tablespoons into the bottom of a 9-inch square baking dish. Arrange sliced fruit on top of the butter and sprinkle with 2 tablespoons brown sugar. Set aside. 2. In a medium bowl, whisk together applesauce, milk, maple syrup, eggs, 1/3 cup of brown sugar, remaining 2 Tablespoons butter and vanilla. 3. In a large bowl, mix together oats, baking powder, baking soda and salt. Stir the wet ingredients into the dry ingredients and mix well. Pour over the fruit and smooth the top. Sprinkle with nuts and remaining 2 tablespoons brown sugar. 4. Bake at 350°F for 40 to 50 minutes, or until browned on top and fruit is bubbly. Allow to cool slightly. Serve with milk or cream. have you ever had oatmeal in an oatmeal raisin cookie bowl? no lie….denver airport. delicious. and i’m definitely trying your baked oatmeal recipe 🙂 thanks for sharing!